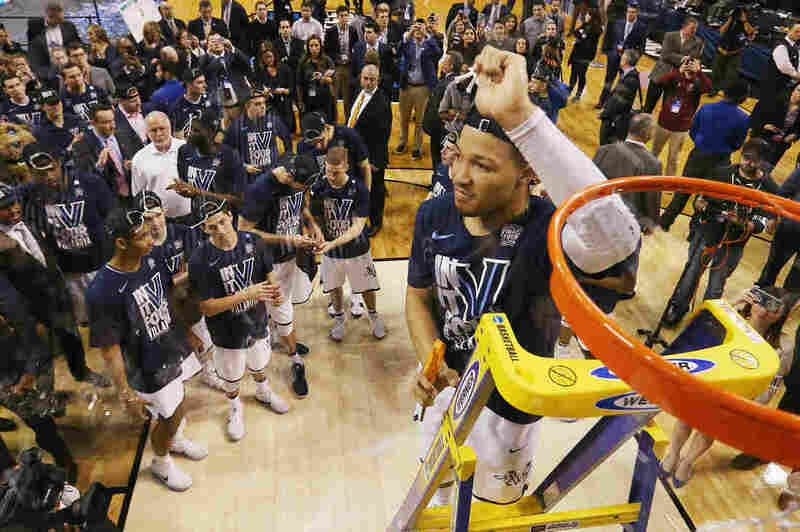 4 Feel-Good Stories Of The Final 4, From Sister Jean To Cool Cops In Kansas : The Two-Way There have been some great moments in this year's NCAA tournament that can still bring a smile to even the smallest sports fans among us. 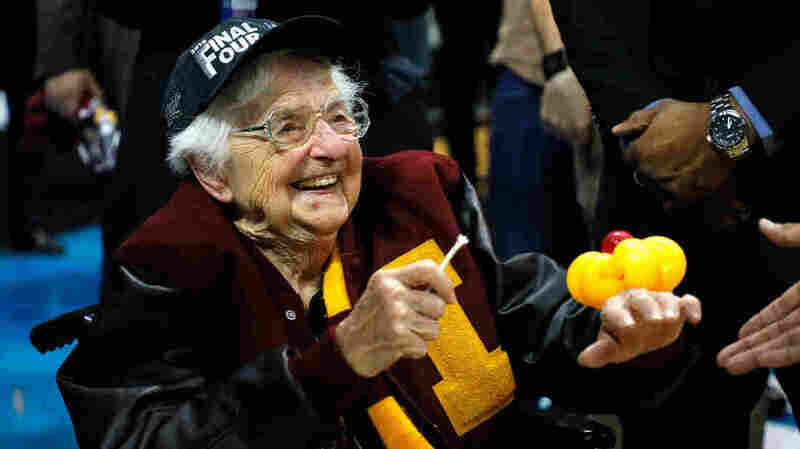 Sister Jean Dolores Schmidt, 98, longtime men's basketball team chaplain, holds a piece of net as she celebrates Loyola's win sending the team to the Final Four. Whoever you are, there have been some remarkable feel-good moments for each of the four remaining teams — from a flying nun to a police-embraced street party — that may kick up your enthusiasm level and help you break a smile, even for the most hesitant of sports fans. Loyola-Chicago: "God bless, and go Ramblers"
When the Loyola University Chicago Ramblers were invited to the NCAA tournament for the first time in 33 years — and then made it all the way to the Elite Eight — it left brackets shattered. It's a classic Cinderella story, and behind every Cinderella, there's a fairy godmother doing some of the heavy lifting. In this case, she's a 98-year-old nun. Sister Jean Dolores Schmidt, otherwise known as Sister Jean, stole the spotlight this year. She has been the team chaplain, full of smiles and spark, for a quarter century. And she has been rooting the Ramblers on for 60 years. Loyola players huddle around their chaplain before each game. Sister Jean — decked in a pair of custom sneakers that have been called both "Air Jeans" and "Prayer Jordans"— says a prayer covering not only her own team but the opponent as well. "Good and gracious God," she begins, according to The New York Times. She asks God to protect the players and to ensure that referees make fair calls, closing her prayer with an "Amen, and go Ramblers!" She has become so popular that she licensed her name and image for merchandise sales for proceeds that go back to the university and charity. In fact, a bobblehead of Sister Jean is now the all-time top-selling bobblehead made by the Bobblehead Hall of Fame and Museum. Sister Jean bobbleheads were previously issued in 2011 and 2015. On eBay, someone's asking $500 for one of those. A new version, due in June and costing $25, can be ordered now. "I think Sister Jean has really captivated the nation," Phil Sklar, CEO of the Bobblehead Hall of Fame, told ABC. "Within 24 hours, we sold at least one bobblehead to someone in all 50 states, D.C., Canada, and the United Kingdom." “Worship. Work and Win!” - Sr. Jean. Pre-order your Sr. Jean bobblehead now! The nun is a former basketballer herself; The Chicago Tribune reports Sister Jean played basketball during high school, before joining the Sisters of Charity of the Blessed Virgin Mary convent in Iowa. The Times reports: Loyola-Chicago head coach Porter Moser found a manila folder on his desk his first day as coach in 2011. Inside it was a scouting report, compiled by Sister Jean, detailing the strengths and weaknesses of each player he had inherited. Sister Jean has been in a wheelchair since breaking her hip in November, but that hasn't stopped her from being the Ramblers' biggest cheerleader. She's still on the sidelines, Air Jeans and all. The Michigan Wolverines celebrate after defeating the Florida State Seminoles 58-54 at the Staples Center in Los Angeles on March 24. Coach John Beilein has led the team to 13 straight wins and now the Final Four. Michigan has the near impossible task of trying to compete with Loyola, not just in their Final Four matchup Saturday but also in best story of the remaining teams. But Michigan does have quite the story to tell in its own right. The Wolverines flew under the radar early in the season, overlooked and underestimated. And yet, here they are — on a 13-game win streak, no less. They've done it with a combination of good shooting, solid defense and a little bit of luck of the draw. Michigan is a 3-seed, and its highest opponent because of a slew of upsets was sixth-seeded Houston. And against Houston, the Wolverines needed a 3-pointer at the buzzer from a freshman to move on. Coach John Beilein credits his team's chemistry and doggedness for its success. "I've never seen a team work so hard and be so connected on both ends of the floor, even when things do not go right on the offensive end," Beilein told The Detroit News. Beilein has instilled a can-do attitude in his team, but it wasn't until recently that the players really believed they could go all the way. "Nah, I'm not gonna lie, I never expected us to make it this far," junior Charles Matthews told The Detroit News. Matthews led the Wolverines in scoring with 17 points in Saturday's win against Florida State. "But we believe now," he said, "and that's where it all starts, with the belief system. ... When you have guys like that who are truly your brothers, anything's possible." 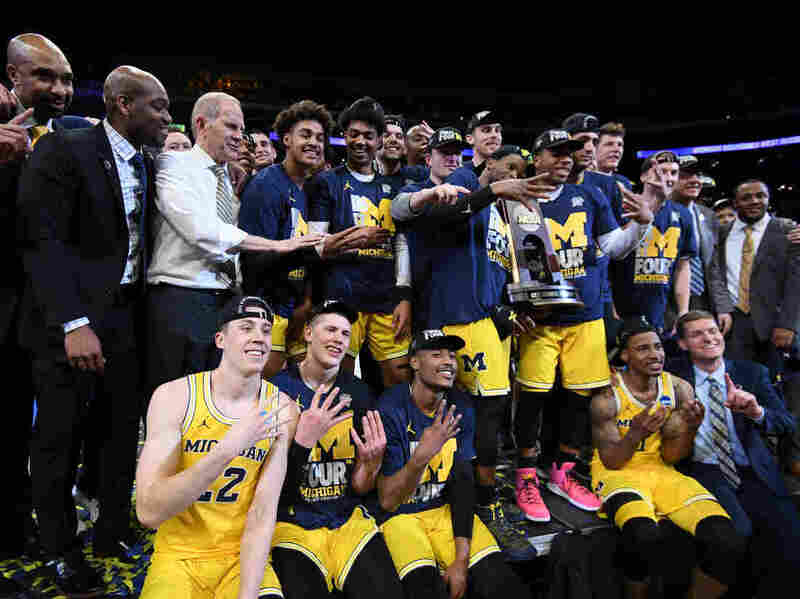 This is the Wolverines' eighth trip to the Final Four, but if they win the national championship, it would also be only their second in school history and their first since 1989. The Fab Five team that garnered so much attention for starting five freshmen — an anomaly at the time in college basketball — lost in the 1992 championship game. They did, however, change the length of basketball shorts forever. Jalen Brunson of Villanova cuts the net after defeating Texas Tech 71-59 in the East Region to advance to the Final Four. Villanova point guard Jalen Brunson takes after his father. He has been a rising star in the sport — just like his dad, Rick Brunson, a retired NBA player. This is Jalen's second NCAA tournament. He played as a freshman when Villanova won the national championship. Rick Brunson didn't make it past the Elite Eight in his NCAA run playing for Temple — against Michigan. Brunson has said his son was named after Jalen Rose, one of his Michigan opponents and one of the members of the famous Fab Five. Brunson made a career as an NBA player and is now an assistant coach with the Minnesota Timberwolves. His busy NBA schedule hasn't allowed him to make every one of son's games, but he was in the crowd on Sunday, cheering Jalen on as the Wildcats beat Texas Tech to make it to the Final Four. Through all the celebration, the 21-year-old Jalen found his father in the first row of the stands and they hugged over the barrier, reported The Salem News. "That was so great — it meant the world to me," said Jalen to The Salem News. "My dad means so much to me, what he does for me and everything else." 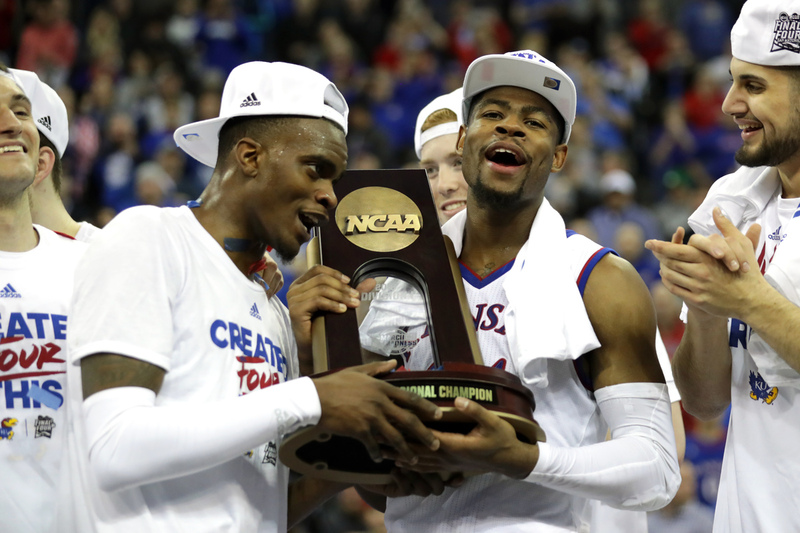 Lagerald Vick (left) and Malik Newman (right) of Kansas celebrate with the regional championship trophy after defeating Duke in the Midwest Region. Sports fans can be rowdy. In 2013, MLB fans flipped cars after the Red Sox won the World Series. Fans of the NFL's Philadelphia Eagles once pelted Santa Claus with snowballs. Celebrations after the Chicago Bulls won NBA championships in 1991 and 1992 led to about 1,000 arrests and $10 million in damage. But in Lawrence, Kan., when the Kansas Jayhawks made it to the Final Four after six years, the city was in pure — and peaceful — celebration mode, reports USA Today, thanks, in part, to the police. Thousands of fans poured into the streets for the hours-long celebration. Lawrence Police tweeted an update on March 25: "0 arrests, 0 citations, 1 Final Four appearance." And though it seemed that it couldn't get any better, it did. The celebration became a police-sanctioned party when law enforcement said that it would be more lenient about open-container laws, as long as the beverages were in plastic cups. The Michigan Wolverines will play the Loyola-Chicago Ramblers Saturday at 6:09 p.m. ET. The Villanova vs. Kansas game will follow, with tipoff at 8:49 p.m. ET. Adrienne St. Clair is an intern on NPR's National Desk; Asia Simone Burns is an intern with NPR Digital News. In a previous version of this story, we said a $25 Sister Jean bobblehead is selling for $500 on eBay. In fact, someone has listed an older version of a Sister Jean bobblehead with an asking price of $500. A new version of the bobblehead, costing $25, is due to be available in June.